i don't have cable so couldn't watch the rachel zoe project until last night. thank gosh hulu.com exists. watched the episode TWICE. first can we all admit that the Harper's Bazaar cover was exceedingly incredible? that was a real giraffe?!?!? i had no idea before i watched the episode. i love love LOVE the concept & process of styling even more now.... and the mcqueen dress and shoes topped it off so perfectly. the perfectly captured expression in the second image. and those platform stilettos in that last photo are so fairytale-worthy and beautiful. completely and perfectly iconic, just as brad & rachel mentioned. "Style can be empowering when you understand your own limits and strengths and know how to exploit them favorably. It is not limited to the rich and famous. We’re all looking for style cues in the way we live. An adjustment here or there or something new (even if it’s really vintage) in your life provides a sense of renewal." "If I’m dressed in clothes that allow me to navigate my wild world without a thought of feeling uneasy or constrained — or downright unpresentable — I feel like me. Comfort nurtures confidence. With my marvelous clients, I strive for clothes, accessories, and jewelry that let them feel their most comfortable. Glamour should be effortless. Or at least look it. High style is also very much about ambience." Ps: I hope you had a chance to take part in my GIVEAWAY!!!! this post is very inspirational! im definitly going to get her book, great editorial! I seriously need to be best friends with this woman. Awesome! Demi is soooooooooo gorgeous! Those photos are beautiful and Rachel Zoe has fantastic taste!!!! AMAZIN women!!!!!!!!!! Have a super wicked summer! Demi looks gorgeous in these images. I have heard about this show but not seen yet! I will have to make some time to catch up on Rachel! Thanks for dropping by my blog! I am obsessed with Rachel Zoe too! I've been watching her show from season one, and it's made me love the fashion world even more. She's such a wacky lady in the best way. That giraffe shot is-- BANANAS. that bazaar cover is absolutely brilliant. 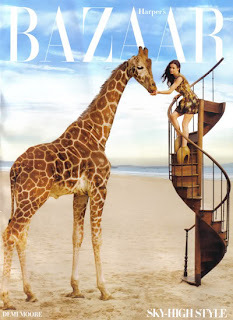 what an amazing idea for a shoot..
wow, never would think that this was a real giraffe! my dear hobo i have to visit u more often and i don't want to miss any of them! really cool post I had never seen that editorial of Demi before! I've hadn't seen the cover, are you in the US? I'm betting that I'm going to start spending way too much on magazines, I currently only buy Vogue occasionally and one other magazine. But now I want to buy Harpers Bazaar, Elle, gosh, there are so many! I love Rachel Zoe! She is an awesome stylist. Her show is my guilty pleasure-tv-fix :) Thanks for commenting on my blog!